← THE PARANORMAL EH? SKELETONS VIDEO CLUE CONTEST! 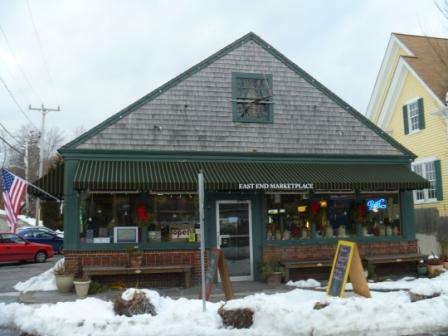 The East End Marketplace in Provincetown--a cozy place to hang out on a cold winter day! I’m pleased to announce that Provincetown’s East End Marketplace is carrying copies of Skeletons in the Swimmin’ Hole: Tales from Haunted Disney World. The East End Marketplace is located at 212 Bradford Street (at the corner of Howland Street) and is open year-round. It features a grocery and a selection of local wines, and their specialty is homemade food, such as Apple Crisp (to die for), meat loaf, macaroni and cheese and pot pie. Their terrific deli offers breakfast sandwiches, subs, and soups made to order. In addition, it’s a local hang out. There are tables to eat at, and it’s not unusual to see people stopping in just to chat. 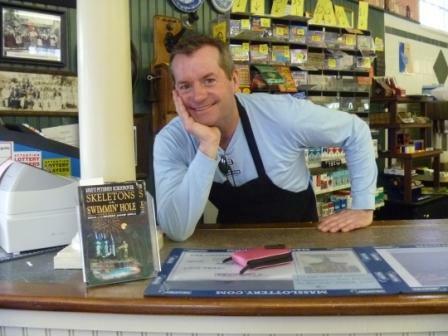 I love this picture of Gary with the books at the counter! Posted on March 4, 2011, in News, Skeletons in the Swimmin' Hole -- Tales from Haunted Disney World and tagged East End Marketplace Provincetown, Skeletons in the Swimmin' Hole -- Tales from Haunted Disney World. Bookmark the permalink. Leave a comment.